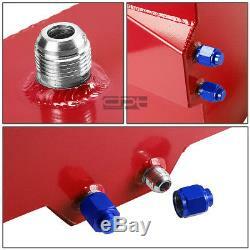 15 GALLON LIGHTWEIGHT RED COAT ALUMINUM RACE DRIFT FUEL CELL TANK+LEVEL SENDER. The OEM fuel tank equipped on every vehicle is made to last the life of the vehicle and for everyday use. However, for racing purposes, it is overly large and heavy. That is where aluminum fuel cells/tanks come in. 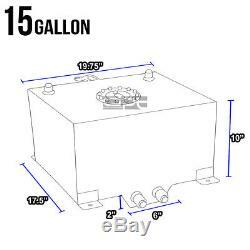 Tank measures 19.75" (L) x 17.50" (W) x 10 (H). Mounting Tabs Measure 18" (L) x 19.25" (W) Center to Center. Dual -10 Vent Outlets (Top Of Cell). 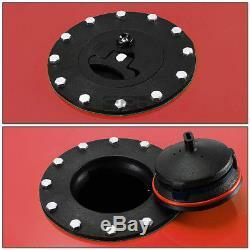 Sump Measures 6" x 6" x 2 Deep. Professional Installation is Highly Recommended. Installation Instruction is NOT Included. Not for use with alcohol, methanol, water. Inspect foam for deterioration regularly. We'd love to hear from you! We stand behind the products we sell. Please inspect all your order(s) upon receipt. All items are brand new unless otherwise stated. PROFESSIONAL installation is highly recommended. 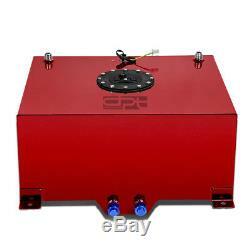 The item "15 GALLON LIGHTWEIGHT RED COAT ALUMINUM RACE DRIFT FUEL CELL TANK+LEVEL SENDER" is in sale since Wednesday, March 30, 2016.